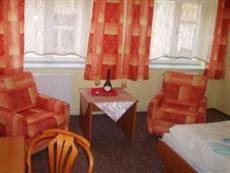 With its central location, Hotel Hvezda is within easy reach of most tourist attractions and business addresses in Cheb. The Hotel Hvezda boasts a convenient location with modern amenities in every guestroom and superb service. The guestrooms are equipped with non smoking rooms, daily newspaper, desk, hair dryer, ironing board, television, separate shower and tub. Guests staying at this Cheb accommodation can enjoy a wide range of hotel facilities such as 24hr room service, executive floor, bar/pub, laundry service/dry cleaning, restaurant. The hotel creates a balance of rich culture and modern convinience to ensure you a memorable stay. For your reservation at the Hotel Hvezda Cheb, please select your dates of stay and fill in our secure online booking form.